What’s the difference between an AquaSport and AquaTrainer? Hydropool Swim Spas are self-cleaning. With basic maintenance such as filter replacements, your work is very minimal. Salt water kits are an option. 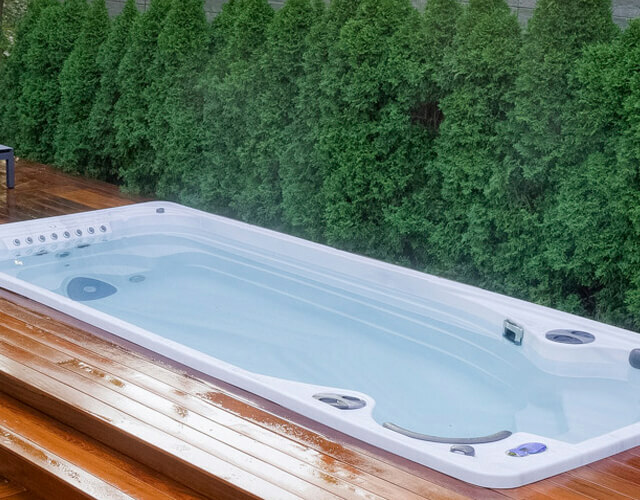 If you’d rather swim in saltwater compared to chlorine, Hydropool can meet your needs. Cost: The Hydropool Swim Spa takes up much less room than a pool, ranging from 12 to 19 feet long. Energy Efficient: These are the most efficient swim spas in the world, providing 100°F for pennies a day. Hydropool uses what’s called a HydroWise Thermal Shield to best insulate your Swim Spa. Main Use The “average” swimmers best friend. The Aquaflow jets allow some customization to water current and strength. The “advanced” swimmers dream. With 10 different speeds and currents, the active user can stay healthy and fit with ease.